Opinions on smartphones vary widely between different emerging economies. The use of smartphones and social media increased rapidly in the past decade in the United States, and these digital technologies have also become common in parts of the developing world. A new Pew Research Center report analyzes public attitudes and experiences related to these technologies in 11 emerging economies – including the benefits and challenges that digital connectivity brings to people’s lives and societies. 1. Mobile phone users see a mix of benefits and pitfalls related to their devices. 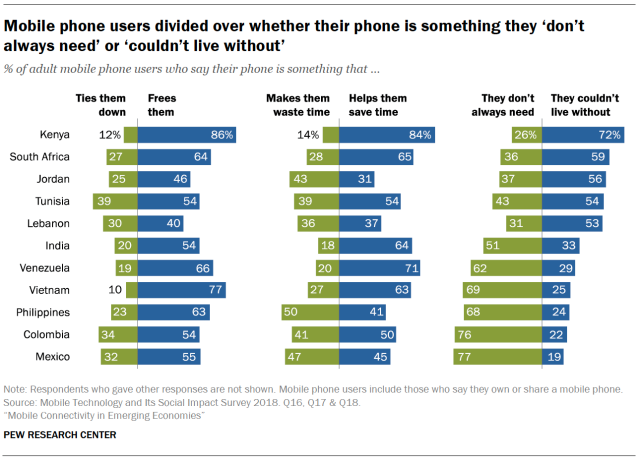 Mobile phone users in each of the 11 countries surveyed are more likely to say their phone is something that frees them rather than something that ties them down. Meanwhile, a larger share of mobile phone users in seven countries believe their phone helps them save time rather than waste time – although in certain countries like the Philippines, a larger share view their phones as a time waster. People in these countries are also somewhat divided when assessing how reliant they are on their mobile device. Kenyans, South Africans, Jordanians, Tunisians and Lebanese who use a mobile phone are more likely to say their phone is something they couldn’t live without. But in the six other countries, larger shares say they don’t always need their phone. 2. Majorities say mobile phones and social media have mostly been good for them personally, but somewhat less so for society. A median of 70% of adults across these 11 countries say mobile phones have been a mostly good thing for society, while a smaller share (57%) say the same of social media. A similar pattern exists when assessing how these technologies impact them personally. A median of 82% say that mobile phones have been mostly good for them in their personal lives, compared with 63% who feel this way about social media. In contrast, a median of 19% say that social media has been mostly bad for them personally, and 27% say it has been mostly bad for society. 3. Those in every country surveyed worry about the impact of mobile phones on children. Across these 11 emerging economies, a median of 79% of adults say people should be very concerned about children being exposed to harmful or immoral content when using their phones. In most countries, half or more say mobile phones and the internet have had a bad impact on children – more than the percentage who say they are concerned about the influence of technology on other facets of society included in the survey, such as politics, local culture and morality. Parents are taking steps to monitor and regulate what their child does online or on their mobile phone. A median of 52% of parents whose children have a mobile phone say they at times limit how much time their child spends on their phone, and a median of 50% say they ever monitor what their child is looking at or doing on their mobile phone. 4. 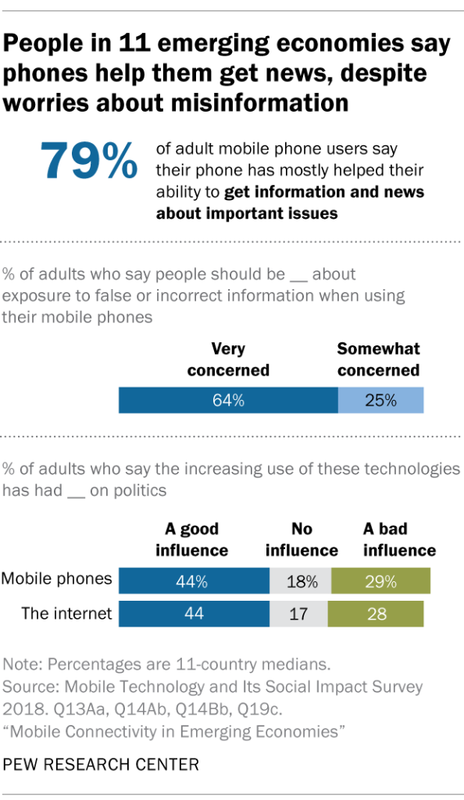 While mobile phone users largely agree that their phones help them get news, many are concerned about the spread of misinformation when using their phone. A median of 79% of mobile phone users across the 11 countries surveyed say their mobile phones have helped them get information and news about important issues. Smartphone users are particularly likely to say their devices bring these benefits compared with those with more basic devices. But, these perceived benefits can often coexist with concerns. A median of 64% of adults also say people should be very concerned about exposure to false or incorrect information when using their mobile phones. More broadly, people in these emerging nations are somewhat divided about the impact of mobile phones and the internet on politics: A median of 44% of adults each say the increasing use of mobile phones and the internet have had a good influence on politics, while a median of about three-in-ten say each has had a bad influence. 5. Public attitudes have become more positive about the internet’s influence on certain facets of society, like the economy and education, in most countries surveyed. In seven of the 10 countries where trend data are available, larger shares today believe that the increasing use of the internet has had a good influence on the country’s economy than did so in 2014. Similarly, views about the internet’s influence on education have grown noticeably more positive in six of the countries surveyed over that time and have only gone down dramatically in Tunisia. 6. Mobile phone users say their devices help them stay in touch with those who live far away. In every country surveyed, about nine-in-ten or more say their phones have helped them in this regard. At the same time, a median of 53% of adults across the 11 countries surveyed say the increasing use of mobile phones has had a good influence on family cohesion, compared with a median of 20% who say it has had a bad influence. People are similarly positive about the impact of the internet on family cohesion. Even so, a notable share of adults express concerns about the impact of mobile phones on interpersonal communication. For instance, a median of 48% of adults say people should be very concerned about people losing the ability to communicate face-to-face when using their mobile phones. And in focus groups conducted as part of the study, some participants highlighted examples of their children texting from the room next door rather than talking to their family. 7. Facebook and WhatsApp are among the most widely used digital platforms in the countries surveyed. Asked about seven social media platforms and messaging apps, a median of 62% of adults in these countries report using Facebook, and a median of 47% say they use WhatsApp. Both of these sites are widely used in a number of countries but are especially popular in Jordan and Lebanon. As is true with other forms of digital technology, use of these social media platforms often varies substantially by age. For example, 91% of 18- to 29-year-old Vietnamese say they use Facebook, compared with just 23% of those ages 50 and older. This article is published with permission from Pew Research Center.